We have every thing you love, wonderful spacious rooms, fabulous meals and service with a smile. All making for a prefect stay. From the moment you arrive at The Retreat you will be inspired and relaxed. Contemporary 5 Star accommodation nestled in 1.5 acres of whimsical gardens away from highways. The Retreat is ideally positioned in town 2 Kms to the CBD. Foodies will feel spoilt with diner and breakfast options made from our produce or can sign up for a cooking class. Its five wonderfully themed guest rooms are contemporary in style with an exotic vibrancy giving a real sense of relaxation and privacy. Where else can you spend a night in Morocco, Japan or a Dungeon! As soon as you walk into the curiously named retreat at Froog Moore Park you realize some interior design genie has escaped from its bottle…The retreat certainly lives up to its reputation as one of the most “unique” accommodation in NSW Pluses – Excellent cooking, accommodating hosts, choice of luxurious or exotically themed rooms. Awarded as the Most Unique Property in “Weekends for Two” and “Unique Places to Stay” magazines it is all you would expect, wonderfully themed guest suites, contemporary in style with an exotic vibrancy. You will be blown away by the magic, imagination and passion, and that’s just first impressions! My partner is a seasoned traveller and always stays in first class accommodation, but even he was gobsmacked when walking into the front foyer. The decor, the atmosphere, the colour scheme, the ambience – it was unlike any other place we’d ever experienced”. It was an absolutely awesome experience. Thank you again for the lovely night we had with you. The room was fabulous and the food was divine!! Proudly an eco friendly property awarded a Green Star Environmental business from AAA Tourism proves you can have luxury while reducing your carbon footprint. The property’s 6000 sq/m water wise gardens are great to explore or swing in a hammock ……and the hot tub spa a must see. Definitely the pick of the bunch. Nestled away in a romantic setting, this retreats sweeping gardens, captivating design and hot-tub spa guarantee you’ll walk away relaxed and rejuvenated. 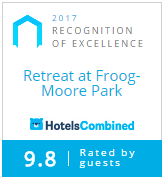 The Retreat at Froog Moore Park is the perfect adult escape providing unique accommodation, sumptuous breakfasts and indulgent dinner packages which makes the perfect gift for any special occasion. You won’t want to leave once you have been spoilt, so be prepared to stay an extra night. Without a doubt the most amazing venue we’ve been to!!! One of only a handful of properties nominated representing Australia in the industry Oscars in the “World Luxury Hotel Awards 2014” recognising serve excellence.